The DHC-6 took off from Grand Canyon runway 21 at 08:55 for a 50-minutes air tour over Grand Canyon national Park. At 09:13 a Helitech Bell 206B JetRanger (N6TC) took off from a heliport near Tusayan for a 30-minutes air tour. Both aircraft collided in the area of the Tonto Plateau, at an altitude of 6500 feet msl. The Bell main rotor blade struck and severed the DHC-6's nosegear. The opposite blade of the Bell struck the aft portion of the fuselage of the DHC-6. A fuel cell of the Vista Liner was ruptured, creating a vaporous cloud of fuel. The rotor head of the Bell 206 separated and debris from the disintegrating rotor blade struck the left side and tail of the DHC-6. The tail separated, causing the DHC-6 to lose control and pitch over. The aircraft struck the ground in an inverted attitude and the helicopter free-fell to the ground following the rotor blade separation. PROBABLE CAUSE: "The failure of the flight crew of both aircraft to 'see and avoid' each other for undetermined reasons. 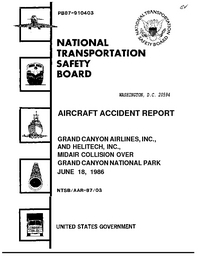 Contributing to the accident was the failure of the Federal Aviation Administration to exercise its oversight responsibility over flight operations in the Grand Canyon scenic air tour operators. Also contributing to the accident was the modification and configuration of the routes of the rotary-wing operators resulting in their intersecting with the routes of Grand Canyon Airlines near Crystal Rapids."